Winter can be an awful season, it’s cold, it’s wet, it’s dark, it’s miserable. 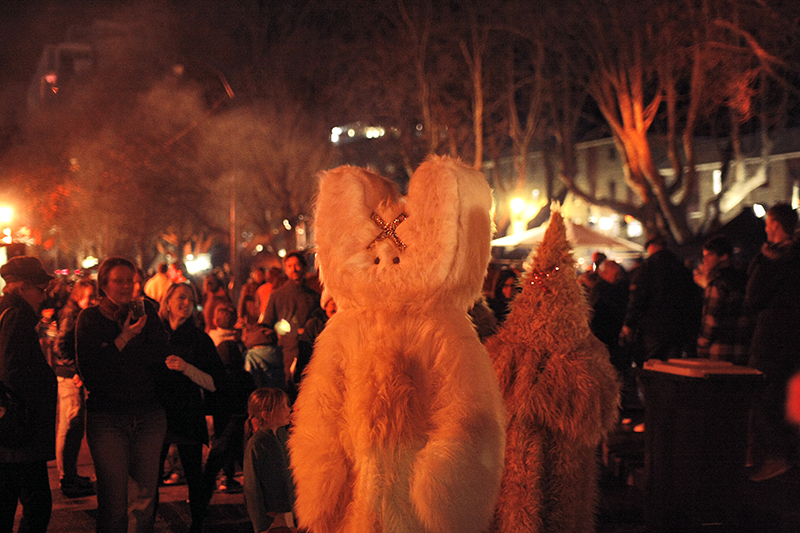 It can also be bloody fantastic if the local artists and their community put on a festival to celebrate the Winter solstice. 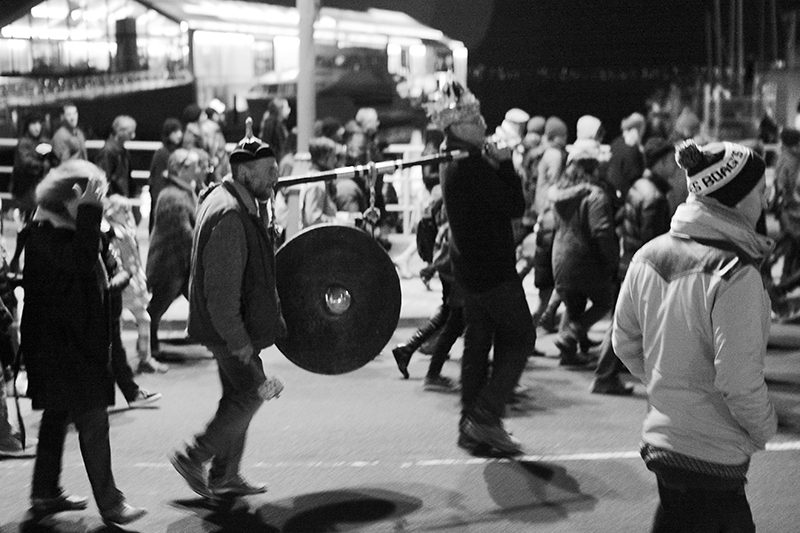 Dark Mofo is Hobart’s celebration of all things dark and just plain out there. 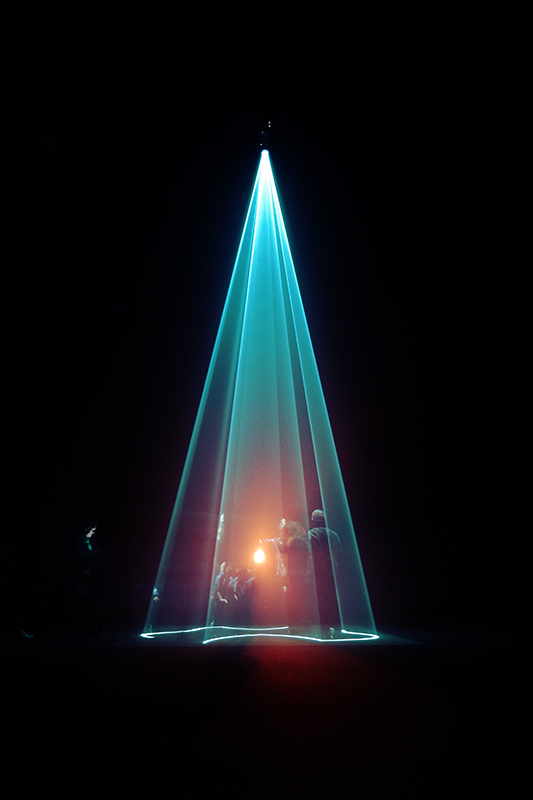 It runs for 10 days and includes dozens of events all over the city with some big names coming to town to play a show or put on an exhibit. 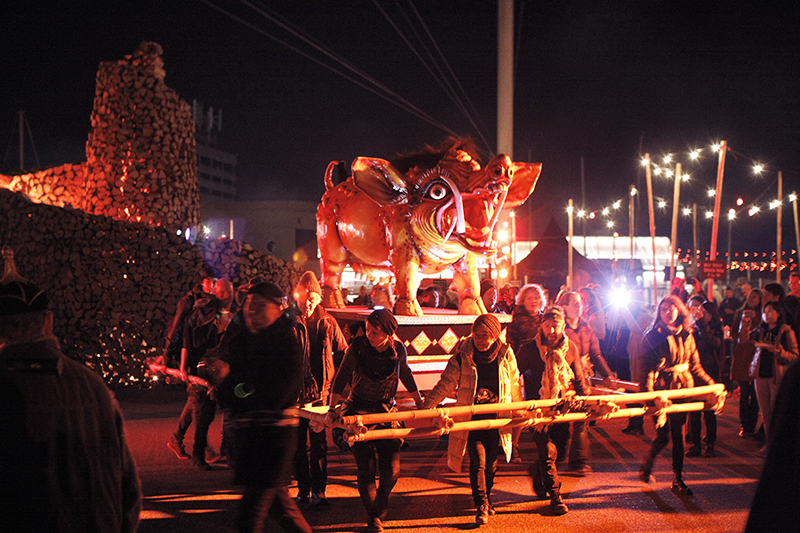 If you’re into your kooky off-kilter art scenes then Dark Mofo is going to be right up your alley. 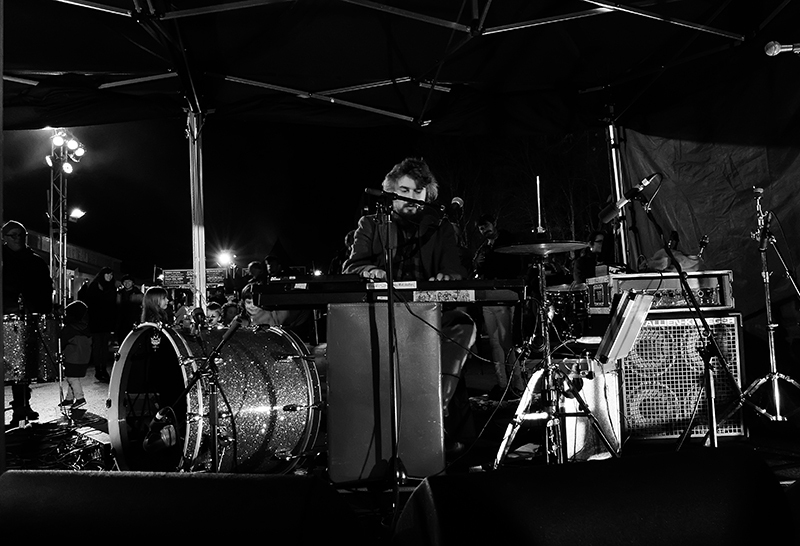 As with all festivals there’s the paid events as well as the free entry ones although these days the number of free events seems to be ever dwindling, replaced by commercial cash grabs at every turn. I saw a “deal” on Facebook the other day for flights from LA to Burning Man……$2,000+ dollars! You could fly to other side of the planet and back for less than that. So many festivals that started out with good intentions have been destroyed by business interests and over commercialisation. These Ogoh-ogoh as they are called, are a part of Balinese Hinduism whereby demon-like sculptures are crafted and then cremated as a form of mass purification. I’m not a religious person by any means and know little of the Hindu religion but I can’t deny there was something wriggling around in my soul when that fish went up and in the moments before, when a large group of people were dancing around it chanting. It was so primal and the polar opposite to our modern bustling, always connected with machines way of life, it felt really good! 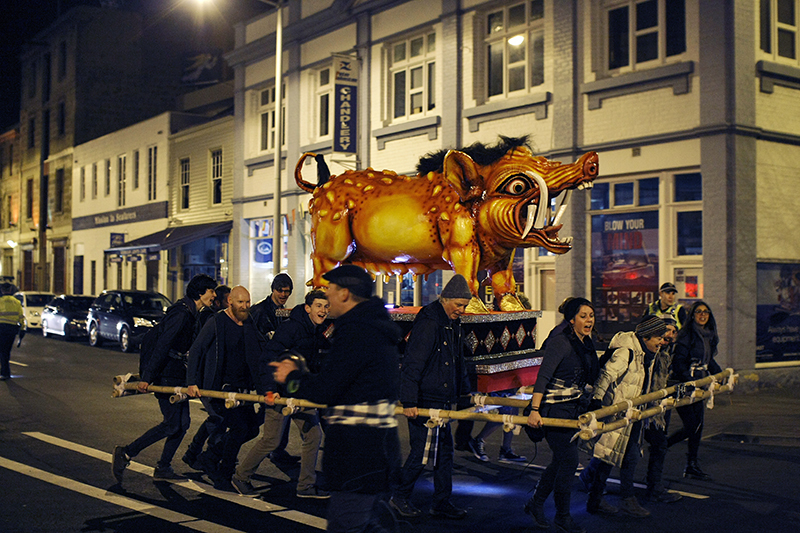 The Ogho-ogho were brought into the Winter Feast venue after being paraded through the waterfront. 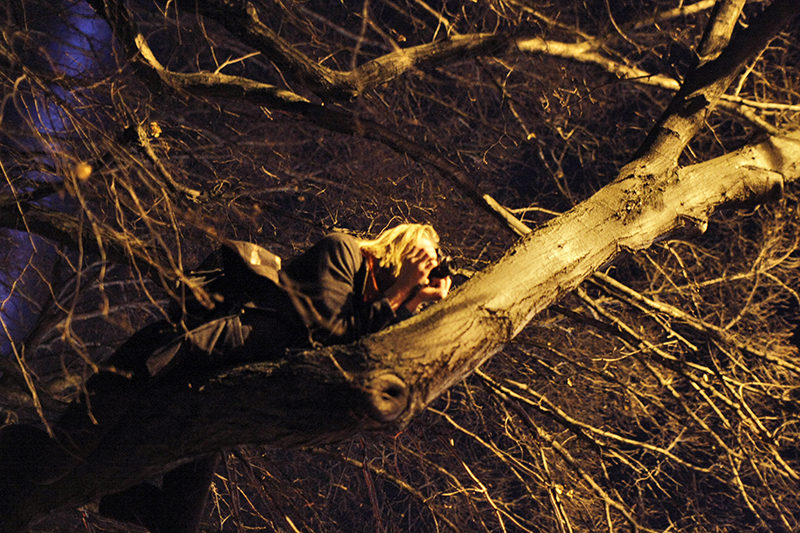 Anything to get the shot, right? 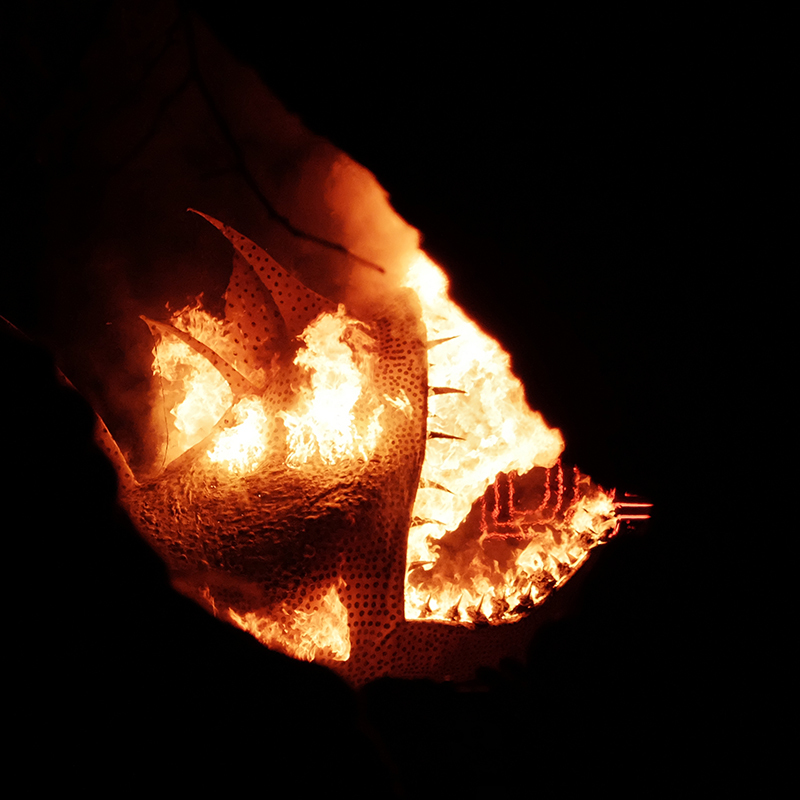 Burn baby burn, fishy inferno. Who ordered the flame grilled fish? 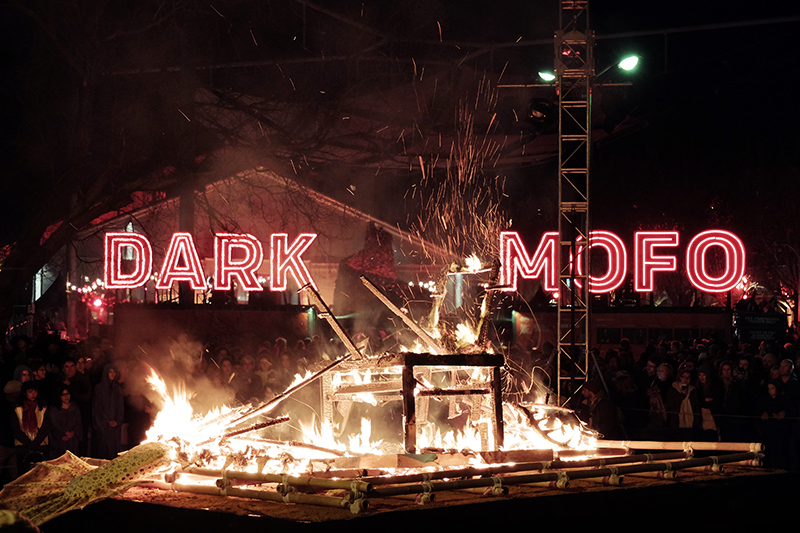 The last embers of the fish burn down in front of the Dark Mofo sign. 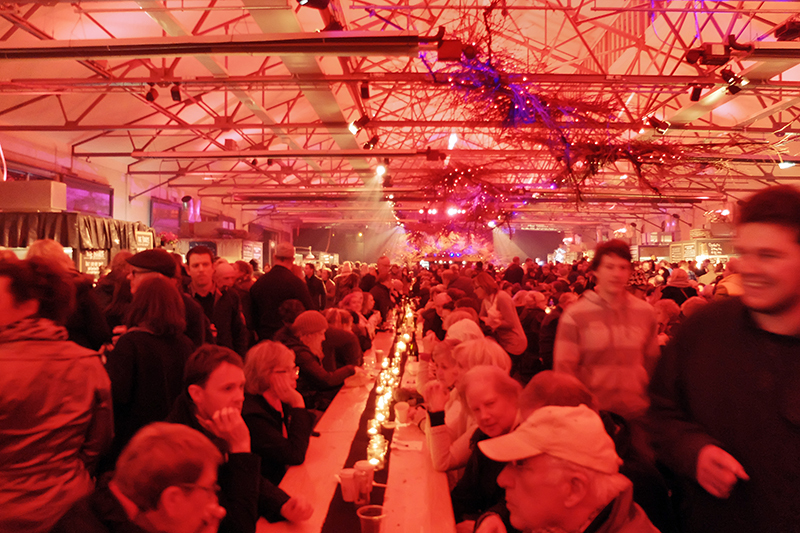 Another highlight was the Winter Feast which took place in Princes Wharf, a huge tent like structure next to Salamanca. We were a little sceptical at first seeing as you had to pay just to get inside nevermind the cost of food once you were in. 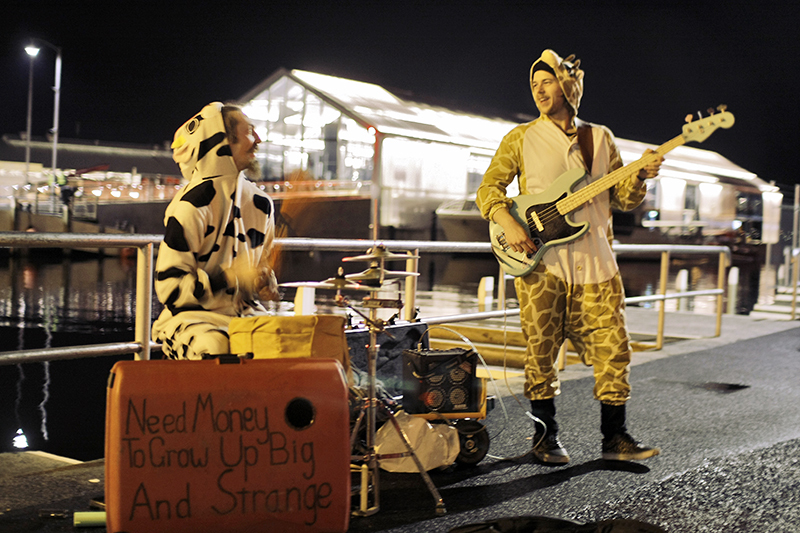 However the entry fee was well justified with plenty of live music and performances to keep you entertained. The food was reasonably priced too…..and freaking delicious! So many stalls to choose from, both inside and out. I went with the chicken drumsticks option which were being barbecued outside in an intriguing setup whereby a large fire in the middle was used to feed red hot charcoal to the barbecues encircling it. There were two flavours, jerk and rum sugar and they were goooooooooooood. After that we went inside and had a wallaby burrito which was equally mouth watering. You can see the full list of stalls here (there were MANY). 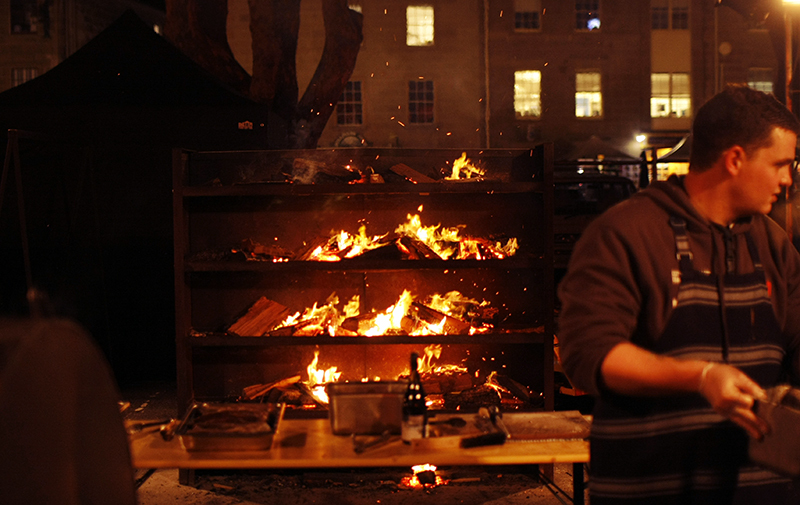 Mmmm things cooked in fire. This girl was giving it socks inside the Feast, really getting into her character. 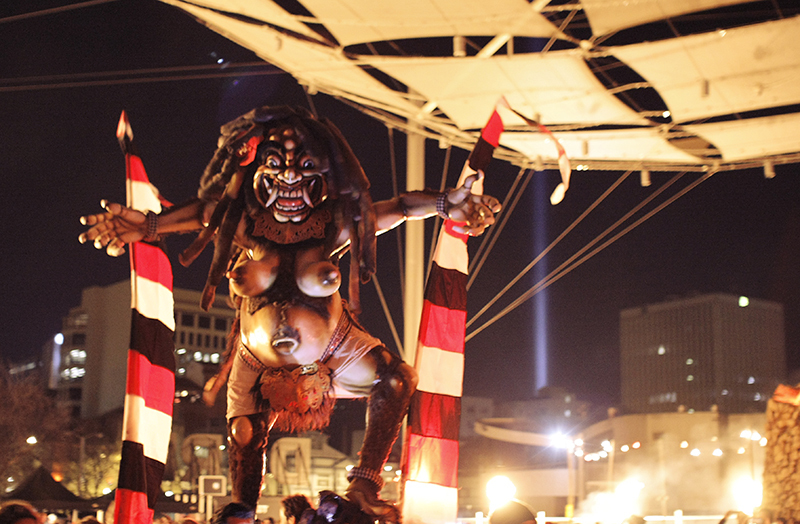 These terrifying creations somehow didn’t scare the hell out of the kids. Bella Fuego from Flamewater Circus in the middle of a routine. The main building reminded me of the huge beer halls in Germany, just with far less beer. 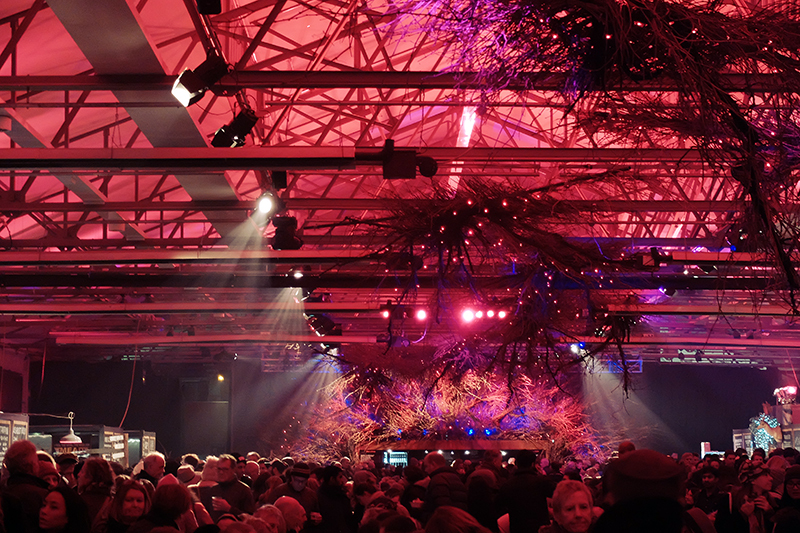 The red lighting and primitive natural elements seem to be the main theme of Dark Mofo. 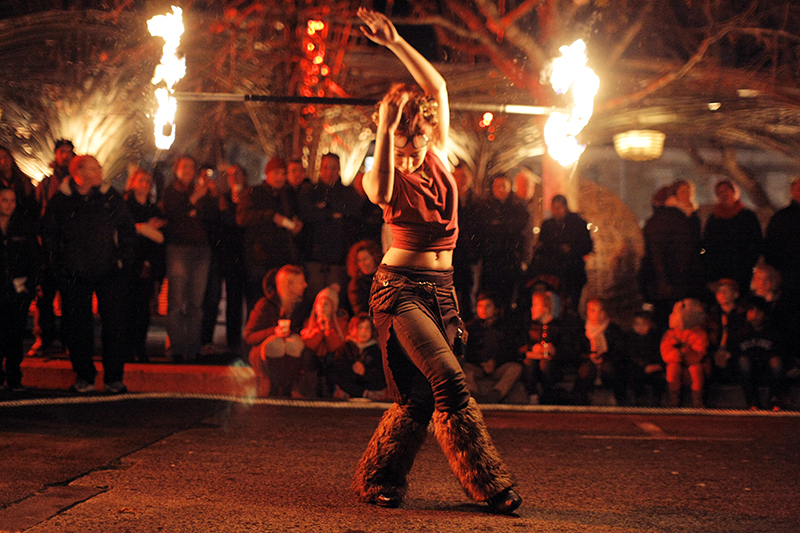 Another member of Flamewater Circus entertains the crowd outside the Feast. This guy was awesome! He’d play really slow dreary sounding Victorian numbers and then blast into super fast Circus-like music which the kids loved. Very entertaining. 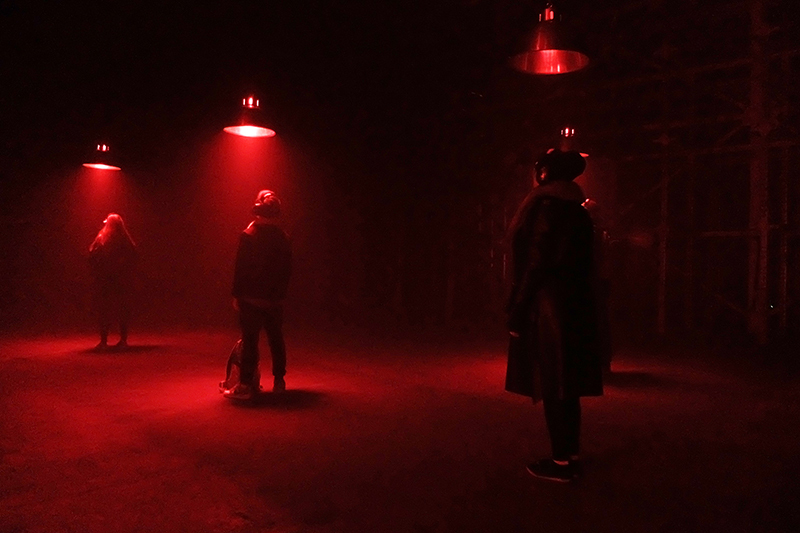 Dark Mofo isn’t just about food and drink though, it’s about sensory experiences, the contrast between light and dark, the silence of Winter, and the noise that you have to sign a waiver form to experience. 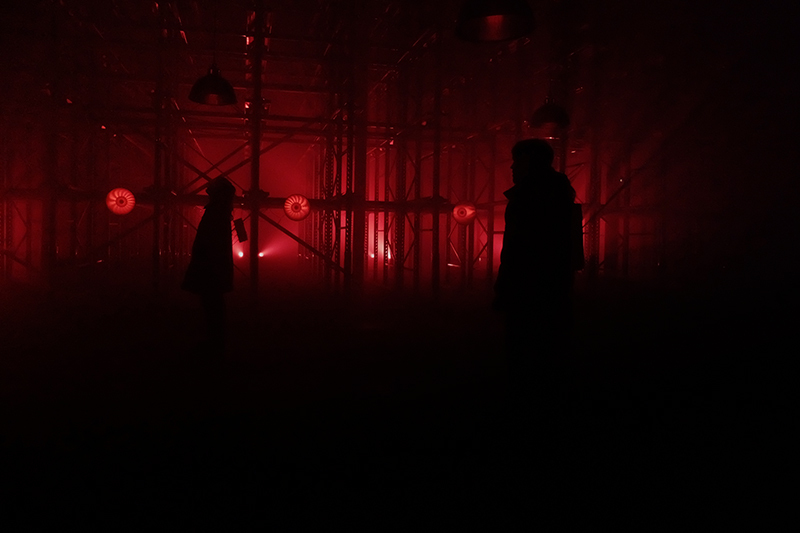 The Bass Bath was an installation setup in one of the empty warehouses at Dark Park. 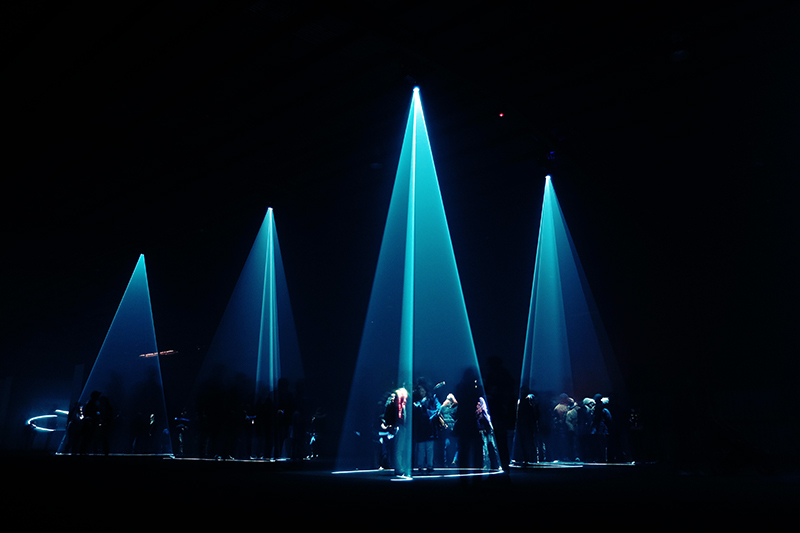 The premise was pretty simple; put on industrial grade noise cancelling earphones, stand under a lamp and be pummelled by extremely loud low frequency bass while a light show does for your eyes what the bass does for you ears and entire body……massages. 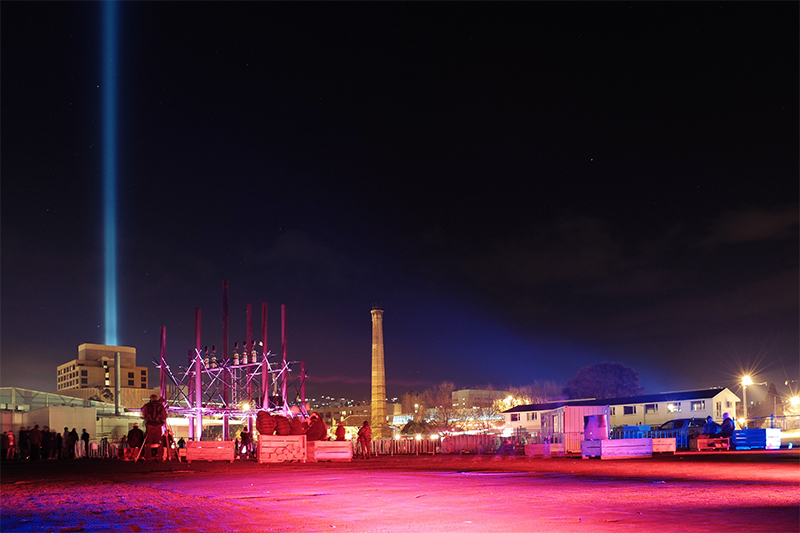 Crowds gather to play with the slowly moving light-show. 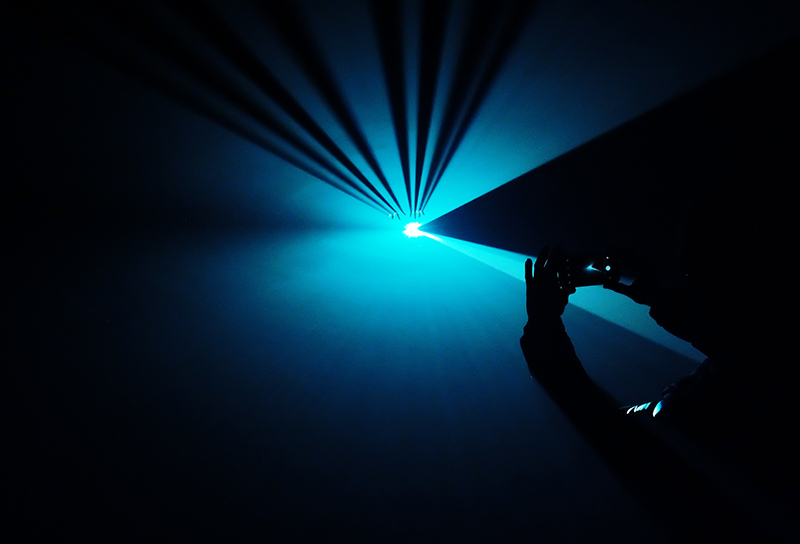 This chap’s illumination assistance lamp on his camera (why?) added a nice bit of colour to this shot. Inside the Bass Bath, I loved the scaffolding at the sides which revealed itself momentarily during the performance. 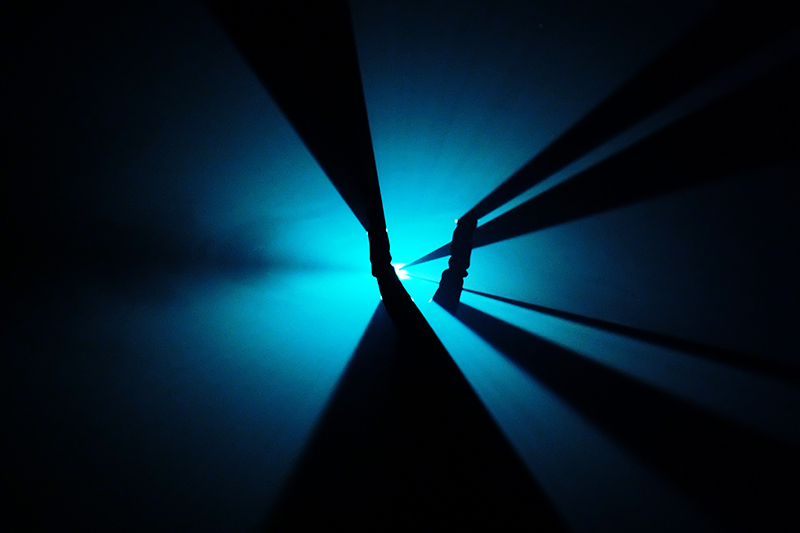 Fingers break through the shaft of light. Our friend Niall does a handstand in the middle of the horizontal lights. 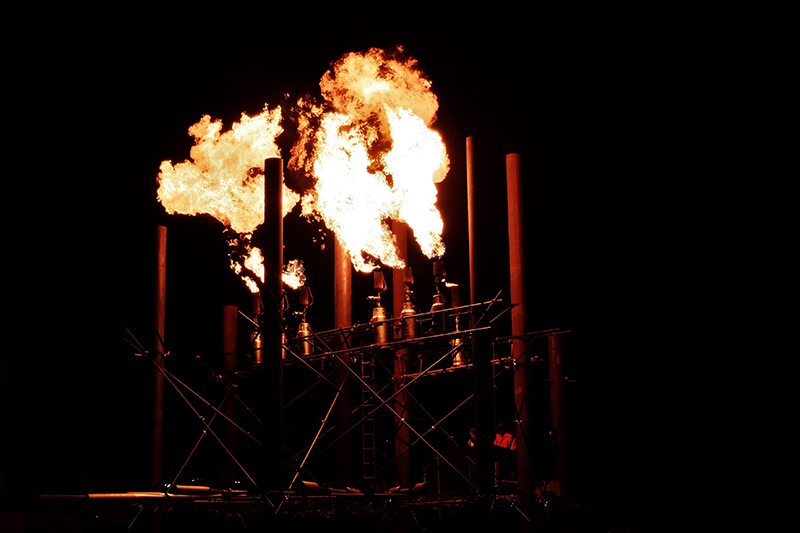 Dark Park also contained the Fire Organ, a rather complex art installation that spat out flames in tune with music being spun by a DJ inside the gantry. There were also what can only be described as large engine exhausts backfiring and spitting smaller flames in tune with the music. It was pretty cool when running at full flow but……I don’t know, I just didn’t quite get it to be honest. 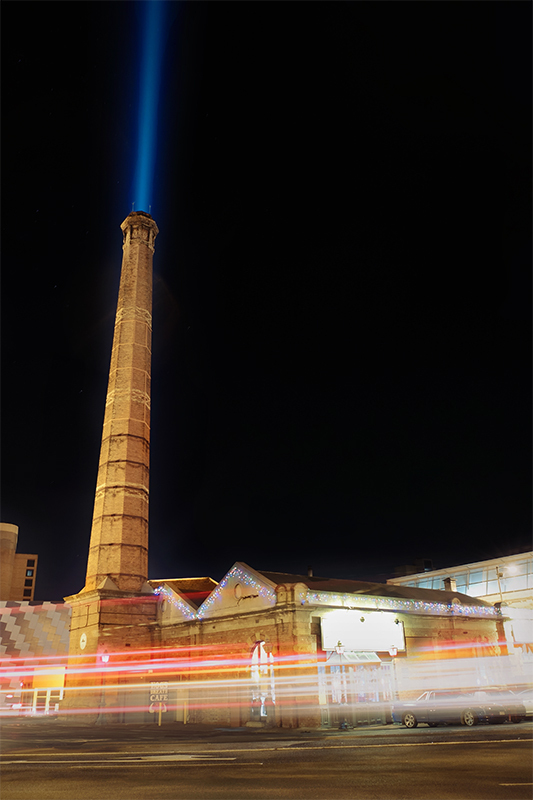 Elsewhere in the city, numerous businesses embraced the Dark Mofo vibe and switched out their regular lights for red bulbs while outside the old Mercury Building, the Pulse Column which could be seen from miles around, drew visitors in wishing to see their pulse transferred into the cosmos through the column. 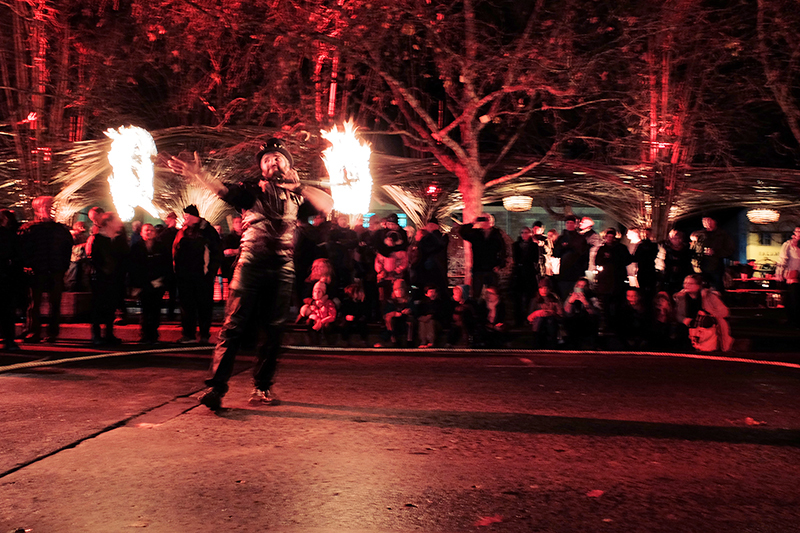 These two chaps entertained the crowds walking to and from the Winter Feast. 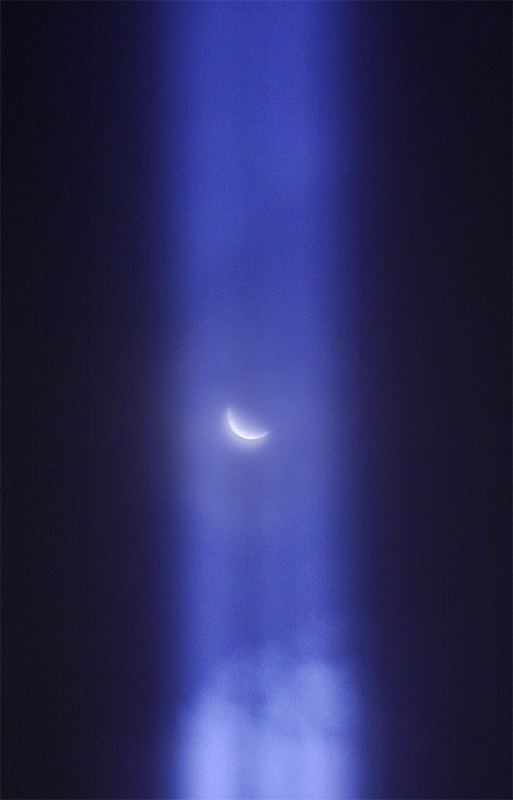 The moon gets caught in the tractor beam of the Pulse Column. 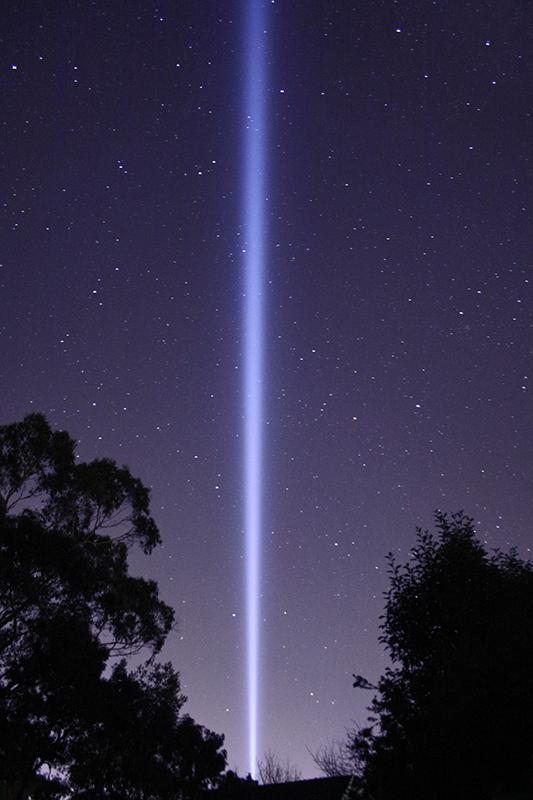 The Pulse Column as seen from outside our apartment a few kilometers away. 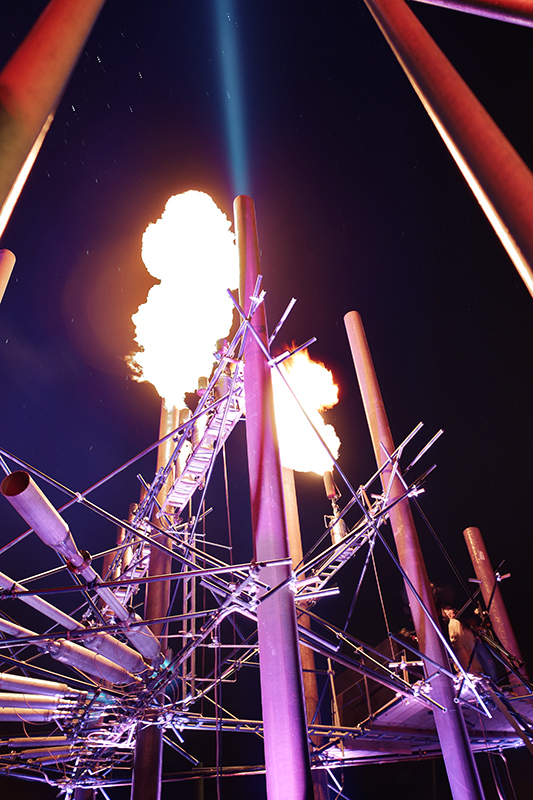 The Fire Organ spews out its flaming beats. 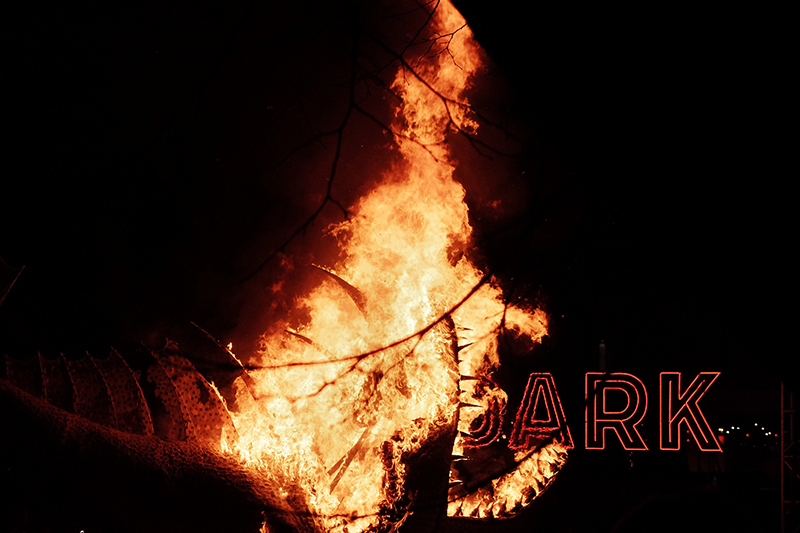 Dark Park was bathed in red lights with numerous barrel fires to keep the punters warm on the chilly Winter nights. 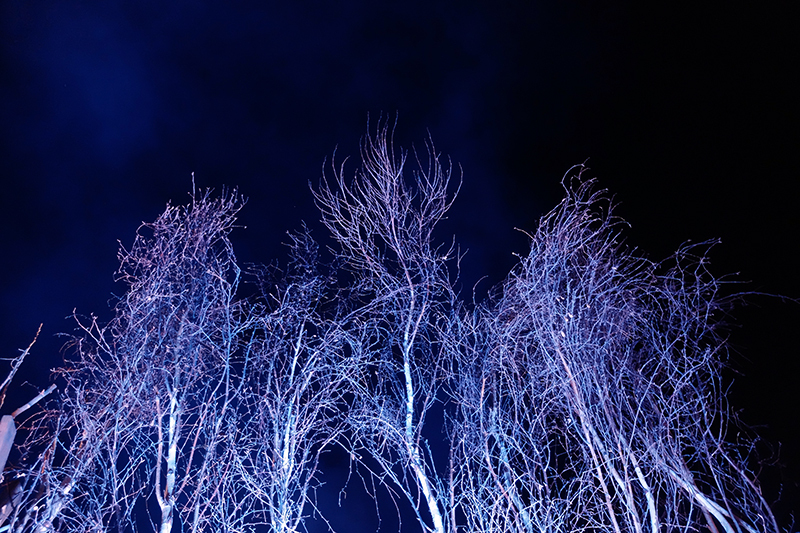 The glowing blue trees outside the Hendrick’s Gin parlour of curiosities. 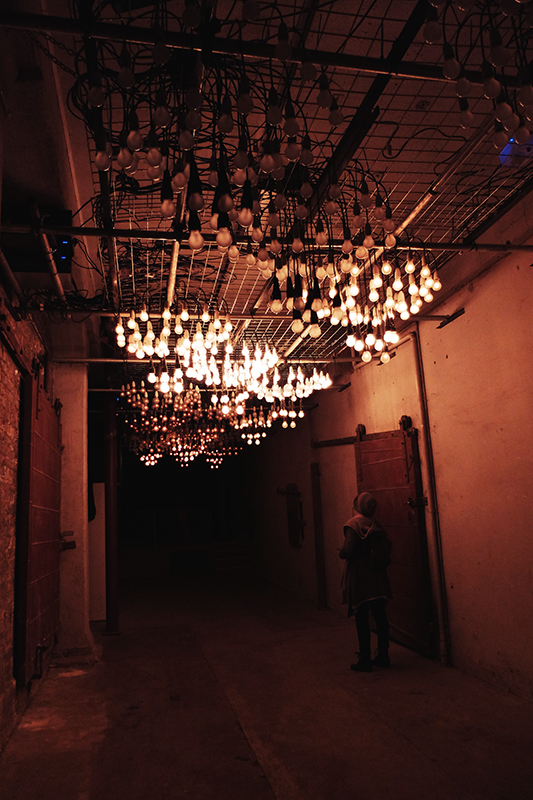 Angry Electrons, 1,000 bulbs that lit up in response to those walking below. 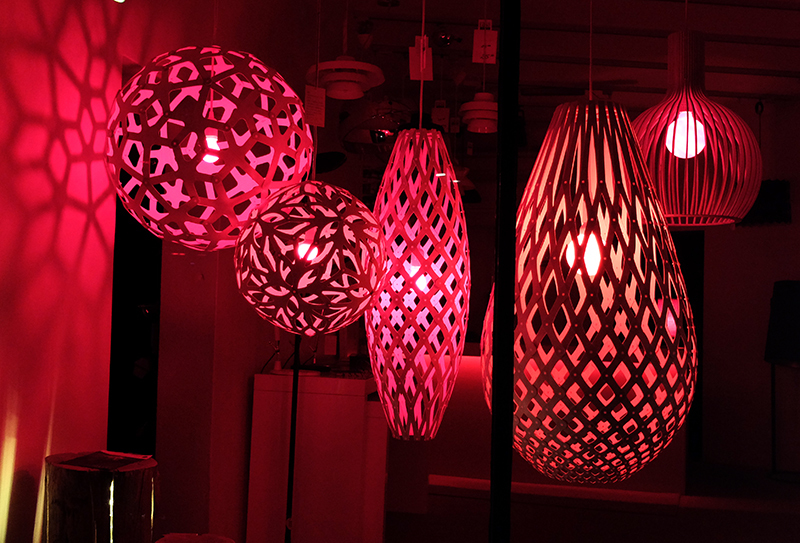 A lighting shop in Sandy Bay got into the spirit of things with their red window display. 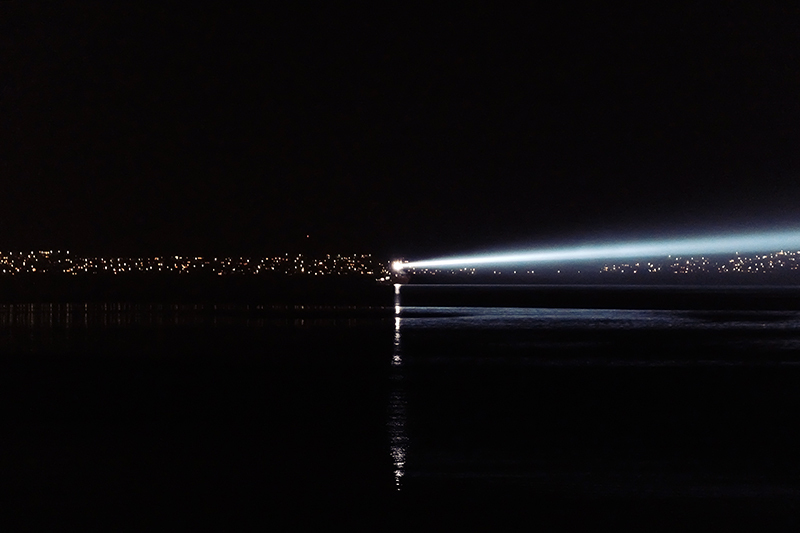 The night ship which was like a mobile lighthouse lit up the harbour each evening. 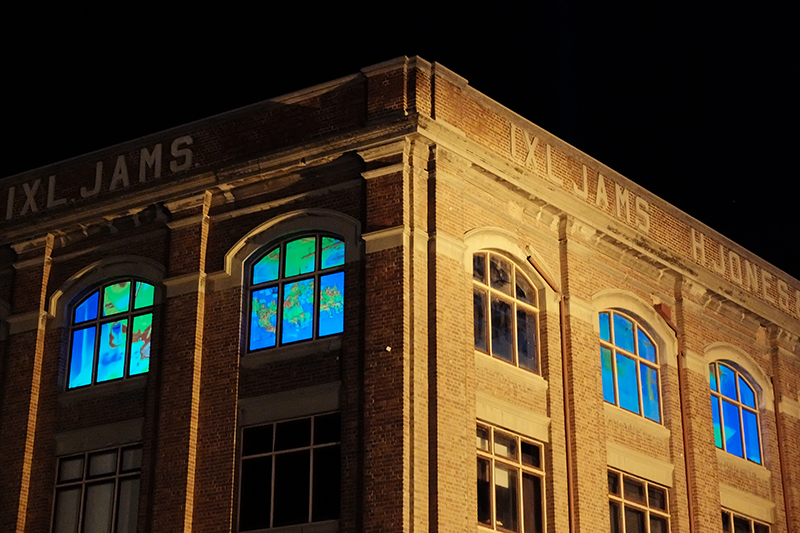 The Radiant Heat exhibit was projected onto the windows of the Centre for the Arts. The Pulse Column protrudes out from the chimney next to the Hog’s Breath Cafe. It was a weird and wonderful few days and certainly helped banish the demons of Winter and bring some light to the darkness and I can’t wait to see what crazy stuff they’re going to have next year!